Background: Neuropathic pain is defined as pain caused by a lesion or disease of the somatosensory nervous system and is a major therapeutic challenge. Several screening tools have been developed to help physicians detect patients with neuropathic pain. These have typically been validated in populations pre-stratified for neuropathic pain, leading to a so called "Catch-22 situation:" "a problematic situation for which the only solution is denied by a circumstance inherent in the problem or by a rule". The validity of screening tools needs to be proven in patients with pain who were not pre-stratified on basis of the target outcome: neuropathic pain or non-neuropathic pain. This study aims to assess the validity of the Dutch PainDETECT (PainDETECT -Dlv ) in a large population of patients with chronic pain. Methods: A cross-sectional multicentre design was used to assess PainDETECT -Dlv validity. Included where patients with low back pain radiating into the leg(s), patients with neck-shoulder-arm pain and patients with pain due to a suspected peripheral nerve damage. Patients' pain was classified as having a neuropathic pain component (yes/no) by two experienced physicians ("gold standard"). Physician opinion based on the Grading System was a secondary comparison. Results: In total, 291 patients were included. Primary analysis was done on patients where both physicians agreed upon the pain classification (n = 228). Compared to the physician's classification, PainDETECT -Dlv had a sensitivity of 80% and specificity of 55%, versus the Grading System it achieved 74 and 46%. Conclusion: Despite its internal consistency and test-retest reliability the PainDETECT -Dlv is not an effective screening tool for a neuropathic pain component in a population of patients with chronic pain because of its moderate sensitivity and low specificity. Moreover, the indiscriminate use of the PainDETECT -Dlv as a surrogate for clinical assessment should be avoided in daily clinical practice as well as in (clinical-) research. 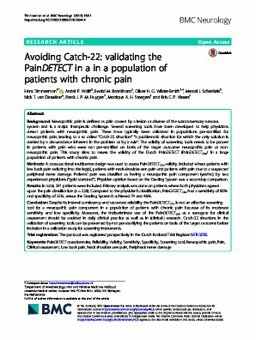 Catch-22 situations in the validation of screening tools can be prevented by not pre-stratifying the patients on basis of the target outcome before inclusion in a validation study for screening instruments.